Even a laryngosaurus can learn Which one of today’s ideas will be tomorrow’s solutions? About 10 years ago, my home institution, the University of Washington Medical Center here in Seattle, served as the only U.S. site in the World Health Organization’s “Surgical Safety Saves Lives” pilot study of a standardized operating room checklist. I had been out of training for 10 years already and didn’t think much of this step other than that it was one more hassle. AAO-HNS reviews and comments on the ABMS “Vision Initiative” draft recommendations As if the medical community needed another pillar of uncertainty, the Continuing Board Certification: Vision for the Future Commission, created to review “continuing certification” within the context of medical practice, released their draft report with 15 numbered recommendations moving forward. Welcome to New Orleans Why wear a badge lanyard when you can wear beads? Registration opens in May. All AAO-HNS members receive a special registration rate. We are so excited to be back in New Orleans, Louisiana, for the AAO-HNSF 2019 Annual Meeting & OTO Experience, September 15-18! Touring New Orleans New Orleans cuisine isn’t the only thing spicing up the city. America’s most authentic city, welcoming nearly 10 million visitors annually, New Orleans hosts major events such as Mardi Gras, Essence Music Festival, Jazz Fest, Super Bowls, and Final Four games, in addition to hundreds of prominent conventions. SRF connects members with top tiers of otolaryngology leadership Section Spotlight The Section for Residents and Fellows- in-Training (SRF) is the gateway to the Academy for all aspiring otolaryngologists at the beginning of their career. Every resident and fellow in an accredited program in the United States is automatically a member of the SRF and is represented by the group. So, what does the SRF do? 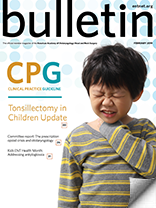 Tympanostomy tube placement Out of Committee Uchechukwu C. Megwalu, MD; Scott E. Brietzke, MD, MPH; Jennifer J. Shin, MD, SM; Vikas Mehta, MD, Outcomes Research Evidence-Based Medicine Committee In this Bulletin segment, the American Academy of Otolaryngology–Head and Neck Surgery Foundation (AAO-HNSF) Outcomes Research and Evidence Based Medicine (OREBM) Committee shares highlights from a 2017 study: “Quinolone Ear Drops After Tympanostomy Tubes and the Risk of Eardrum Perforation: A Retrospective Cohort Study." Which one of today’s ideas will be tomorrow’s solutions? About 10 years ago, my home institution, the University of Washington Medical Center here in Seattle, served as the only U.S. site in the World Health Organization’s “Surgical Safety Saves Lives” pilot study of a standardized operating room checklist. I had been out of training for 10 years already and didn’t think much of this step other than that it was one more hassle. As if the medical community needed another pillar of uncertainty, the Continuing Board Certification: Vision for the Future Commission, created to review “continuing certification” within the context of medical practice, released their draft report with 15 numbered recommendations moving forward. Why wear a badge lanyard when you can wear beads? Registration opens in May. All AAO-HNS members receive a special registration rate. We are so excited to be back in New Orleans, Louisiana, for the AAO-HNSF 2019 Annual Meeting & OTO Experience, September 15-18! New Orleans cuisine isn’t the only thing spicing up the city. America’s most authentic city, welcoming nearly 10 million visitors annually, New Orleans hosts major events such as Mardi Gras, Essence Music Festival, Jazz Fest, Super Bowls, and Final Four games, in addition to hundreds of prominent conventions. Successful legislative advocacy starts with a solid grassroots foundation. Members of Congress want to hear from their constituents—physicians and patients—about how healthcare decisions made on Capitol Hill affect them. 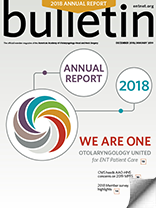 American Academy of Otolaryngology–Head and Neck Surgery members have a powerful voice on a wide range of topics, including reimbursement issues, scope of practice expansions, and hearing health proposals. From AcademyU, a New AcademyQ-2019 set now available! 400+ New Questions AcademyQ® is an excellent tool for test prep to enhance your knowledge of otolaryngology- head and neck surgery by assessing your recall, interpretation, and problem-solving skills. Mobile-app features include: Rationales for each question, additional reading references, images, and videos to enhance learning. The ability to highlight notes, add comments, and mark questions for future reference. 24/7 Access – anytime, anywhere from your phone, tablet or laptop. Visit www.entnet.org/academyq. Calling all OTO Techs – New Spring Workshop! The CPOP Workshop is a three-phase training program designed to teach otolaryngology office personnel basic hearing testing that allows audiologists to focus on complex audiometric testing, advanced hearing, and balance services. Section Spotlight The Section for Residents and Fellows- in-Training (SRF) is the gateway to the Academy for all aspiring otolaryngologists at the beginning of their career. Every resident and fellow in an accredited program in the United States is automatically a member of the SRF and is represented by the group. So, what does the SRF do? New Resources The American Academy of Otolaryngology–Head and Neck Surgery has prepared new member resources outlining the Top 100 Current Procedural Terminology (CPT) codes reported by providers with the subspecialty designation of “4-Otolaryngology” within the Medicare enrollment database. PRACTICE PROFILE Sady Selaimen da Costa, MD, MSc, Phd, currently serves as Chair of the American Academy of Otolaryngology–Head and Neck Surgery Foundation (AAO-HNSF) International Advisory Board (IAB). He took time out of his schedule to share his global perspective and diverse experience in practice and leadership with the Bulletin. A 2019-2020 chair-elect of the International Advisory Board (IAB) will be elected at the American Academy of Otolaryngology–Head and Neck Surgery Foundation (AAO-HNSF) 2019 Annual Meeting & OTO Experience in New Orleans, Louisiana. Share the poster featured here with your patients and spread the word about the importance of a healthy voice. 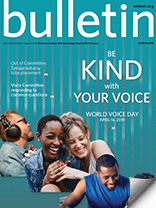 Visit www.entnet.org/worldvoiceday to print your 2019 poster and access other World Voice Day resources. Being Kind to your Voice is something that is easily practiced but often bypassed in the activity of every day. One of the more common results of this neglect is hoarseness, dysphonia. Use these tips to remind your patients to practice voice kindness this month to begin a new habit that may ensure a lifetime of connection. 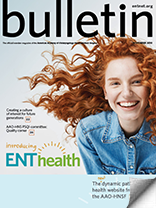 Find more for patients at https://www.enthealth.org/. This past October, a team of two otolaryngologists, a general surgeon, and an orthopedic surgeon descended upon Migori in Southwestern Kenya to provide a week of surgical care for adult and pediatric patients. I was fortunate to accompany this team with the support of the American Academy of Otolaryngology–Head and Neck Surgery Foundation Humanitarian Grant program. Thanks to the American Academy of Otolaryngology–Head and Neck Surgery Foundation Humanitarian Travel Grant Fund, I was able to travel to Malindi, Kenya, to participate in a two-week surgical training camp led by faculty from Vanderbilt University Medical Center. During this trip, I served in numerous roles for the surgical team with a primary goal of assisting in educating local surgeons who were involved in the training camp. I had the opportunity to participate in the 2018 Cleft Exchange by Love without Boundaries from November 25, 2018, to November 30, 2018, in Lanzhou in Gansu, China. We were based at the Gansu Provincial Hospital. In September 2018, I accompanied the Medical Missions Foundation on a service trip to Gulu, Uganda. Under the supervision of Brandon Johnson, MD, we treated patients at Saint Mary’s Hospital Lacor in the clinic and performed surgeries during a week at the hospital.